There was a time when I would never have considered a circle photo, then I went thru a faze of creating them all the time…then it was oh no don’t cut your photo’s into circles, but if you look around Circles are everywhere again! They are back with a vengeance….and why not!!! The circle is one of the best shapes and is part of the geometric group of shapes that form the basic elements of design. Circles can add interest to a design, they help to organize and separate elements and they can also help to direct the eye through your layout. Working with circles is fun, don’t be scared…here are a few techniques and suggestions, that could help you to create some perfect pages by adding a circle or two! Use a dinner plate to trace a circle and challenge yourself to work within the circle only. 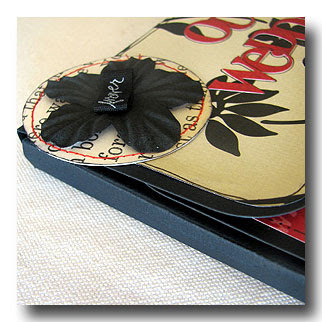 Use a old cd as a page element or even as a template for adding circles with brads or eyelets! The Design Team girls, were given the challenge of circles, this month, lets hope something here inspires you to go forth and create circles…. 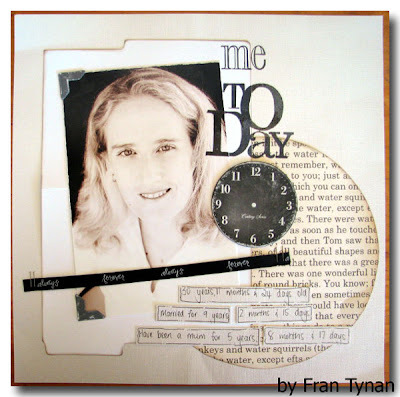 I have loved circles since my introduction to scrapbooking in my CM days...but don't use them to the same extent! 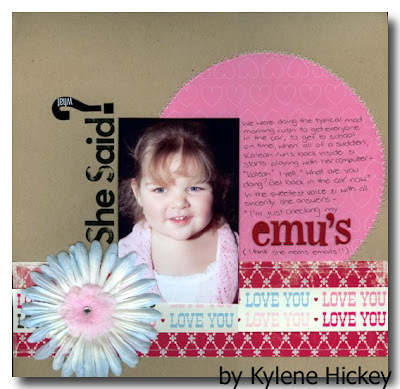 My 'Summer Fun' layout was inspired by an Ali Edwards layout in CK, it was fun to revisit the circular photo! In 'Biker Babe' I had a bit of a play around - again I had a memory of a layout that I had previously seen. I love that the circles add a softer feel to a layout; they can add a sense of movement & flow. I just love the effect that circles have on a layout. 'Biker babe' - Bazzill cardstock; My Minds Eye wild asparagus - 'so pretty' dots/light pink; HS ghost letters; FTI pearl brads medium; MM beach rubons; Stampin Up stamps. 'Summer Fun' - cardstock; SEI paper; American Craft -Accents BK1, Ned Jr; Queen & Co go green round brads; Signo white pen. 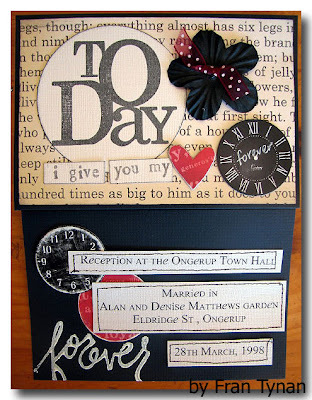 'Dimples' - Bazzill cardstock; BG Oh Baby!Boy - jackson, peapod, letters; Heidi Swapp polo ribbon; Queen & Co boy crazy hook ups. When I first heard that this month's focus was on circles, it got me thinking about all the different ways we can incorporate circles on our layouts. Sometimes bold, sometimes subtle - from patterned papers, to chipboard embellishments, from stamping to stitching, we can cut from papers and cardstocks, overlapping and intertwining, big, small, the possibilities are endless. Unfortunately my hands could not keep up with the creative mind, so I have stored all of these ideas away for future use. "Some days I just feel like I am going round in circles"
"You spin me right round baby"
Let's see what you can come up with!!! "Growing Up" - Patterned papers - Crate Paper Baby Bee collection, Heidi Swapp Chipboard alphabet, Cherry Arte Chipboard embellishment, Carolees Creations rub-on's, stranded embroidery thread. I have hand stitched stars to form a circle frame. Focusing on circles was hard, I liked how my 'Enjoy' LO came out, though the photo doesn't show up the Gemstone brads, but they really do look good outlining the circles. The other 2 LO's just came together easily using the brads as the focus on circles. 'Enjoy'- Bazzill cardstock, Stitching, HS ribbon - sweet pea horizontal & adore, HS Acrylic Stamp Enjoy, francheville green paint & green journaling pen. I’ve always wanted to a LO inspired by circles, I see them occasionally in the scrapping magazines and I'm always inspired, but don’t actually do anything!!! (lol) I’ve always been mostly a Layout person but with this FA design team position I have been inspired to step outside my comfort zone and create something I wouldn’t ordinarily do. 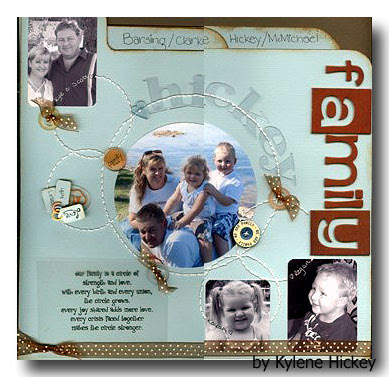 For the first Circle inspired project I made a simple chipboard circle album held together by a small silver chain, "Family/Friends". 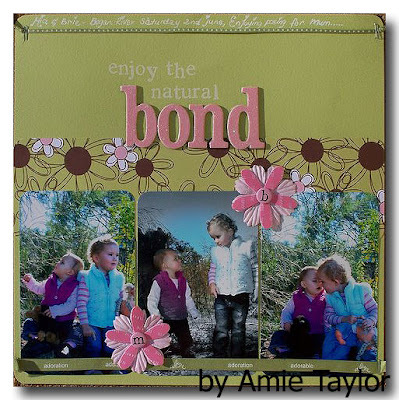 I used a variety of Jenni Bowlin papers; with assorted embellishments on one side and then a coloured photo on the other. The theme of the circle album is Family/Friends and includes photos of my 'Adelaide' family/friends. The photos are relatively unadorned, just the occasional Jenni Bowlin [Bird & Branch-Black] rub-on. On the Flip side I used a background of the patterned paper and then included a monogram [Basic Grey undressed mono, mini mono's, Provo Craft Rob and Bob mono's]. Some were already painted and the undressed I painted with Making Memories and Semco Paint, I also used dimensional magic on 1 of the mono's. I then added a simple adornment/embellishment, which included; s.e.i. crochet flower, flowers punched from Jenni bowlin papers, foof-a-la buttons, American Craft and Creative Imaginations Rubons. I used minimal Journaling. ['Can you feel the Love']. 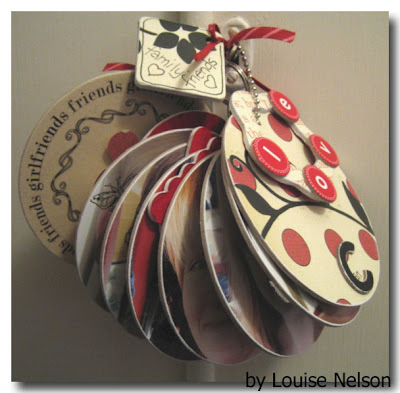 I added some Queen & Co. round chipboard letters to smaller decorative tags in-between the photos. Assorted flowers were also used for embellishment including; Imaginence, and Bazzill bitty blossoms. I added some Heidi Swapp ribbons to the chain holding it all together. The smaller tags in-between the photos were covered in Jenni Bowlin Patterned Paper on 1 side and painted on the flipside. 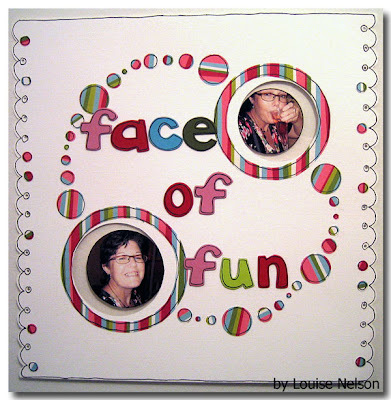 The second project is a Layout called "Face of fun". The photos are of me on Christmas Day 2006 enjoying one of my favourite things - Bubbles [appropriate don’t you think - lol]. The Background is white Bazzill cardstock. I then cut out 2 circles and backed them with a clear circle of overhead transparency. I then adhered the photo to the transparency. 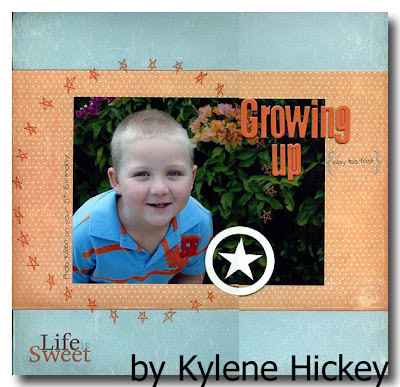 I used Patterned paper from Scenic Route to cut and punch out different sizes of circles to accentuate the photos and decorate the page. I painted the undressed chipboard letters to match the patterned paper. And then, because I can’t help myself I had to doodle I used a Zig memory pen to draw around the photos and patterned paper circles. I cut a scalloped edge along both sides of the page, and further decorated this with punched holes and dots of patterned paper. 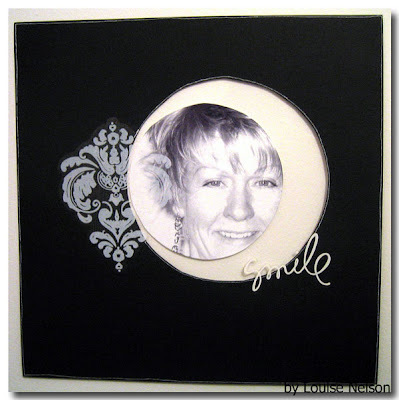 The third project is really simple Layout, "Smile". The background is black Bazzill cardstock. I then repeated the same technique as the last layout with the clear transparency. On the left side of the photo I applied a white Heidi Swapp Damask sticker and on the right of the photo the Heidi Swapp acetate word title - Smile. I used a white Signo gel pen to outline the page, and large cut-out circle. 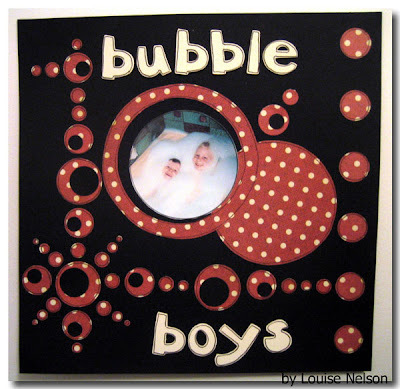 The fourth project is a Layout, 'Bubble Boys". For this I once again used a black cardstock background. Along the ride side of the page I punched out a line of circles and then backed this with a Jenni Bowlin patterned paper. 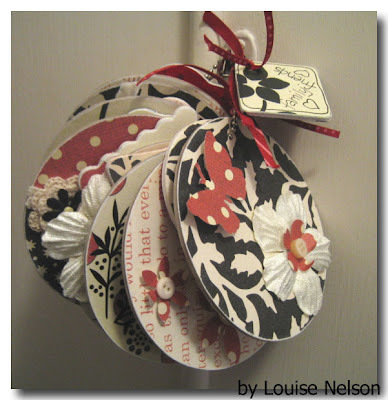 The rest of the circle design on the page is made up of punched out circles of the same Jenni Bowlin paper and the black cardstock. For the title I painted some undressed monos with cream paint and then outlined them and the punched out circles with the Zig memory pen. The photo is of my godson Philip and his brother Daniel. 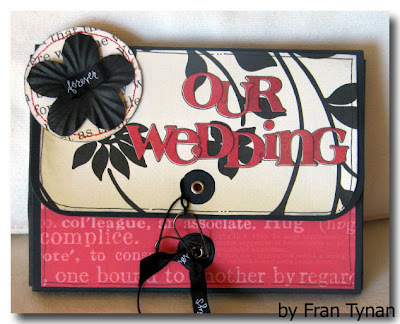 Fran created this wonderful little fold out wedding album, from the Bazzill Route 66 Accordian Keeper, with loads of circle embellishments; I think this also continues the wedding theme by reiterating the ring theme. 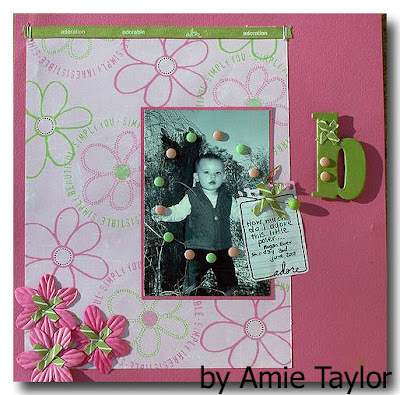 Her second project me today LO shows a creative way to use the Heidi Swapp Foto Folders. The one stamp used inside the circle on the wedding album, looks totally different when stamped across the layers of the layout.